BuNo 139177 was the 389th of 419 production F4D’s built by Douglas in Santa Monica, CA. 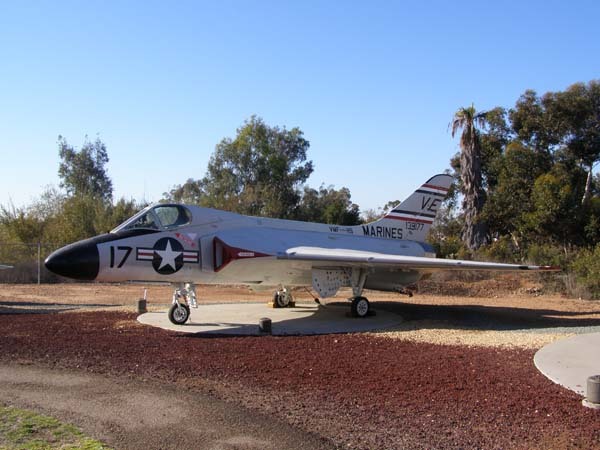 It was delivered in 1958 to VMF-115 at MCAF Mojave, CA. 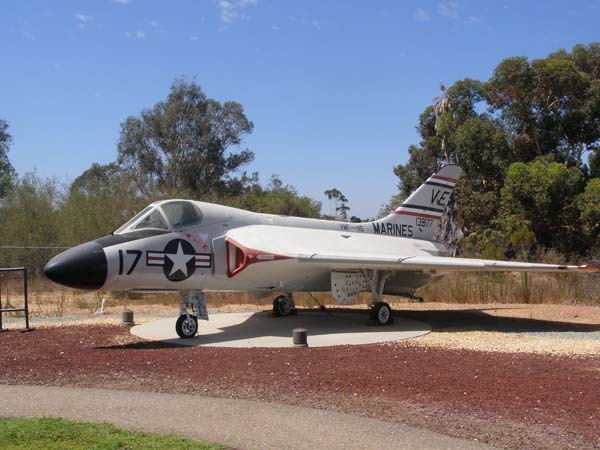 It spent 1959 with the Navy’s VF-141 here at NAS Miramar and VF-213 at NAS Moffett Field. In 1960 ‘177 returned to the Marine Corps and VMF(AW)-314 at MCAS El Toro and was then based out of NAS Atsugi with VMF(AW)-542 and VMF(AW)-513, returning to El Toro in 1962. It finished out active service with VF-13 at NAS Cecil Field, and placed in storage in 1963 at NAF Litchfield Park, Arizona. In 1965 ‘177 was pulled out of storage and served with the Naval Test Pilot School before being struck off charge Nov. 25, 1969. This aircraft is on loan from the National Museum of the Marine Corps. The service life of the Skyray with the Navy and USMC was relatively brief, since the aircraft was specialized in the high-altitude interception role and lacked the multi-mission capability that was becoming increasingly important. The F4D had a good climb rate, a high service ceiling, a relatively high speed, all features which made it a good interceptor. The F4D never saw any combat, although it was deployed to Taiwan in 1958 and to Guantanamo in 1962 in response to crises. In all, Douglas built 421 of the manta-shaped fighters. Eight Marine Corps squadrons operated the F4D transitioning from the F3D Skyknight and F9F Panthers and Cougars. VMF(AW)-542 was the last active duty Skyray squadron, rotating back to the USA in November 1963 from Atsugi, Japan. The six active duty squadrons transitioned to the F-4B Phantom II while the two reserve squadrons went on to fly the F-8 Crusader. On May 22 and 23, 1958 at Naval Missile Center, Pt. Mugu, Major Edward N. LeFaivre set five time-to- height records in F4D-1 BuNo 130745. These were 3000 meters (9842.5 feet) in 44.39 seconds, 6000 meters (19,685 feet) in 1 min 6.13 seconds, 9000 meters (29,527.5 feet) in 1 minute 29.81 seconds, 12,000 meters (39,370 feet) in 1 minute 51.23 seconds, and 15,000 meters (49,212.5 feet) in 2 minutes 36.05 seconds. Length: 45 ft., 8 in. Wingspan: 33 ft., 6 in. Max Speed: 722 mph at 36,000 ft.